Cardiac, respiratory (including severe asthma), renal, liver, neuromuscular and metabolic disease, organ transplant recipient, diabetes, cancer, impaired immunity (including HIV), down syndrome or alcoholism. The Australian Government has three cancer screening programmes under way - for bowel, breast and cervical cancers. As part of an increased commitment to cancer screening the National Bowel Cancer Screening Program (NBCSP) and BreastScreen Australia are being expanded. The NBCSP is expanding and two-yearly screening for all Australians aged 50-74 will be phased in over the next five years. In 2015 we commenced invitations to 70 and 74 year olds to screen for bowel cancer using a faecal occult blood test in the privacy of their own home. The remaining age groups will be included from 2016 to 2020. BreastScreen Australia has also expanded its target age range and now Australian women aged 50 to 74 are invited to undertake breast screening every two years. These changes mean that more people will be screened and more lives will be saved. In addition, changes to the National Cervical Screening Program were recommened by the Medical Services Advisory Committee in April 2014. These recommendations are currently being considered by Australian governments and progress updates will be available on Cancer Screening. Inportantly, women should continue to be offered two-yearly Pap smears until the Renewal Program is implemented. Step 1 Spray a frying pan with oil. Cook chicken over medium heat for 3–4 minutes each side, or until cooked through. Transfer to a plate. Step 2 Add onion to pan and cook until soft. Add stock and rice to pan. Simmer for 10 minutes, stirring, until rice is tender and liquid has evaporated. Stir through peas and parmesan and cook for 1 minute. Step 3 Spoon a third the risotto onto a serving plate. Top with chicken, season with pepper and serve with a large green salad. Step 1 Preheat oven to 180°C. Spray a 24-hole mini muffin tin with oil. Step 2 Sift flour and salt into a large bowl. Add zucchini, corn, ham and cheese and stir to combine. Set aside. Step 3 In a separate bowl, whisk together milk, egg and sunflower oil. Stir wet ingredients into dry ingredients, until just combined. Step 4 Divide mixture between muffin holes. Cook in preheated oven for 12 minutes or until golden and cooked through. ​A yummy and healthier option for this favourite soup. ​1. Heat olive oil in a large deep pan, add onion and garlic and sauté until light golden. 2. Add carrots, water, stock powder, tomatoes and tomato paste and bring to the boil. Reduce heat, cover and simmer for 15 minutes. 3. Stir in pasta, cannellini beans, green beans and zucchini and bring to the boil. Simmer covered a further 10-15 minutes or until pasta and vegetables are tender. 4. Remove from heat, stir in basil. Serve with crusty bread. Diabetes is a chronic condition. This means that it lasts for a long time, often for someone's whole life. For our bodies to work properly we need to convert glucose (sugar) from food into energy. A hormone called insulin is essential for the conversion of glucose into energy. So when people with diabetes eat glucose, which is in foods such as breads, cereals, fruit and starchy vegetables, legumes, milk, yoghurt and sweets, it can’t be converted into energy. Instead of being turned into energy the glucose stays in the blood. This is why blood glucose levels are higher in people with diabetes. Glucose is carried around your body in your blood. Your blood glucose level is called glycaemia. Then phone the surgery on 49433066 to book a spot in the next group Master Class. Dietitians, Tamara Orr, Emma Mercieca and Joannah Pearce who have joined Smith Street Medical Centre are conducting these classes and they are filling very quickly. Changing your lifestyle to achieve a healthy weight isn’t as hard as it may sound. Changing a few unhealthy habits and sticking to these changes may be enough to meet the goals for the family. Goals should be small and realistic for long term benefit and involve the whole family. Parents and carers are encouraged to be positive role models for healthy food and exercise habits. Younger children, unless very overweight, should not actually lose weight, but grow into their weight. Deliberate weight loss in children can affect growth and development. The aim at this young age is weight maintenance. Good breakfast choices include wholegrain, high fibre cereals such as weetbix or Special k or multi grain bread for energy and lean protein for fullness. Soft drinks, cordials and fruit juices contain a significant number of kilojoules and are high in sugar, without many other nutrients. For this reason water should be the main drink of choice for children. Limit high energy snacks and choose only one small packaged snack food for the school lunchboxes each day and a calcium rich dairy choice (e.g. low fat yoghurt or custard). 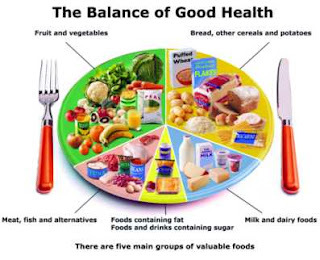 Choose breads, cereals, rice and pastas which are low GI carbohydrate rich foods. Some products have the GI of the food on their labels (the lower the number, the lower the GI of the food). Meals need to be consumed away from distraction such as television and ideally consumed with the family at the table. Having set meals can help avoid consistent grazing. This grazing often leads to excess calorie intake, with people eating more then they think! Both food and eating for children needs to be enjoyable and fun. It is important to include regular, portion controlled treats once or twice per week as this achieves a balance between good nutrition and overeating when these foods are excessively available. School canteen or takeaway meals once each week, are two examples of treats that can be included on a weight control plan for children and adolescents. Encourage your children to eat salad and vegetables for lunch and dinner. This will give a range of nutrients needed for good health and help them meet their recommended daily serves.